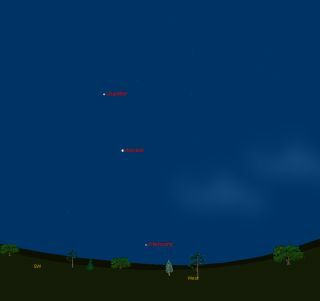 This sky map shows how the planet Mercury will appear in the night sky just after sunset on Feb. 22 to observers at mid-northern latitudes. The planet Mercury is often cited as the most difficult of the five brightest naked-eye planets to see. I've always thought this was a bad rap because there are some times during the year when Mercury is surprisingly easy to see. Mercury is called an "inferior planet" because its orbit is nearer to the sun than that of the Earth. Since it always appears from our vantage point to be in the same general direction as the sun, relatively few people have set eyes on it. There is even a rumor that the famed scientist Copernicus, living in northern Poland, never saw it. Yet the planet Mercury is not really that hard to spot in the night sky. You simply must know when and where to look, have a night of good weather, and find a clear western horizon. And for those living in the Northern Hemisphere, we're about to move into a very fine "window of opportunity" for seeing Mercury in the evening sky. That window, which will open on Feb. 22 and close after March 12, will provide several good opportunities to see this so-called "elusive planet" with your own eyes. The sky map of Mercury with this column shows how it will appear on Feb. 22 alongside the bright planets Venus and Jupiter. First, a tip for reference: Remember that held at arm's length, your fist measures about 10 degrees in width so you can use it to make a reasonable estimate of degrees either horizontally or vertically. Your first chance at sighting of Mercury will come this Wednesday (Feb. 22). About a half hour after sunset, look about 10 degrees to the left of due west and sitting side by side by side 6 degrees above the horizon will be Mercury and the moon, only about a day past new phase. Scanning that area of the sky with binoculars will aid your search. Mercury will shine at magnitude -1.2, only a trifle fainter than Sirius (the brightest star in the sky). The planet will be about 5 or 6 degrees to left of the exceedingly thin/hairline crescent moon, which will be a mere 1 percent illuminated. In fact, among the stars and planets, Mercury will rank a respectable fourth brightest, behind Venus, Jupiter and Sirius. If your sky is clear and there are no tall obstructions to your view (like trees or buildings), you should have no trouble in seeing it as a very bright "star" shining with just a trace of a yellowish-orange tinge. Another way to find it is to draw an imaginary line from Jupiter to Venus and then extend that line down toward the horizon; that line will point in the general direction of Mercury. In the evenings that follow, Mercury will diminish in brightness — slowly at first. But the planet will also be arriving at its greatest eastern point, 18 degrees to the east of the sun, on March 5. This is Mercury's best eastern apparition in 2012, although the elongation angle itself is less than the other two. By this time, Mercury will have faded in magnitude to -0.3 — only about half as bright as it appeared on Feb.22, and yet perhaps easier to see as it will appear higher and be set against a somewhat darker sky. Mercury, like Venus, appears to go through phases like the moon. This week, just when Mercury starts appearing in the western twilight sky, it will be a nearly full disk, which is why it starts out appearing as bright as Sirius. By the time Mercury arrives at its greatest elongation, it will appear about half-illuminated and the amount of its surface illuminated by the sun will continue to decrease in the days to come. So when it begins to turn back toward the sun's vicinity after March 5, it will fade at a rather rapid pace. In fact, by the evening of March 12, Mercury's brightness will have dropped to magnitude +1.5; about as bright as the star Castor in Gemini and only one-twelfth as bright as it is now. In telescopes it will appear as a narrowing crescent phase. This, in all likelihood, will be your last view of it, for the combination of its rapid fading and its descent into the brighter sunset glow will finally render Mercury nearly impossible to spot as the tiny orb swings through inferior conjunction with the sun by March 21. Interestingly, the time it takes Mercury to rotate once on its axis is 59 days, so that all parts of its surface experience periods of intense heat and extreme cold. Although its mean distance from the sun is only 36 million miles (58 million kilometers), Mercury experiences by far the greatest range of temperatures: nearly 900 degrees Fahrenheit (482 degrees Celsius) on its day side and minus 300 F (minus 184 degrees C) on its night side. In the pre-Christian era, Mercury actually had two names, since it was not known it could alternately appear on one side of the sun and then the other. The planet was called Mercury when in the evening sky, but was known as Apollo when it appeared in the morning. It is said that Pythagoras, about the fifth century B.C., pointed out that they were one and the same. If you snap an amazing photo of Mercury or any other skywatching target that you'd like to share for a possible story or image gallery, please contact SPACE.com managing editor Tariq Malik at tmalik@space.com.